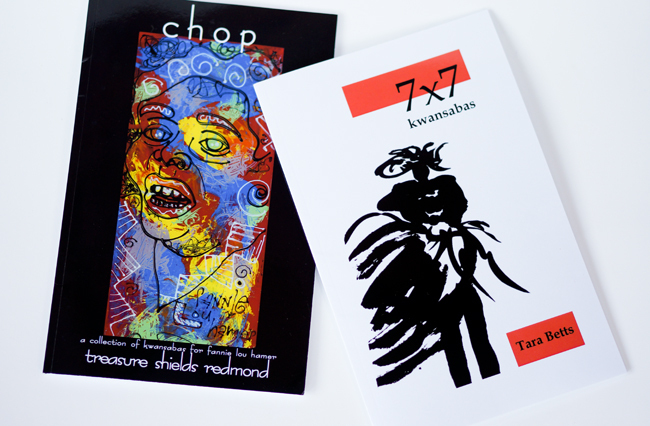 Treasure S. Redmond and Tara Betts published books comprised of kwansabas in 2015. This past year, I kept tabs on several activities, news items, and publishing concerning African American poetry. What follows is a partial list of developments that caught my attention. • January: Elizabeth Alexander appointed the inaugural Frederick Iseman Professor of Poetry. • January: Elizabeth Alexander named Chancellor to Poetry Academy. • February: Nathaniel Mackey awarded Bollingen Prize for Poetry. • March: Kamau Brathwaite receives the Robert Frost award. • March: Aracelis Girmay and Roger Reeves are among Whiting Writers' Award winners. • March: Claudia Rankine awarded the National Book Critics Circle for Poetry for Citizen. • April: Thomas Sayers Ellis and Rowan Ricardo Phillips awarded Guggenheim Fellowships. • April: Jericho Brown awarded Anisfield-Wolf Book Award for The New Testament. • April: Ross Gay selected as Radcliffe Institute Fellowship recipient. • April: Gregory Pardlo awarded Pulitzer for Poetry for Digest. • June: Danez Smith awarded Lambda Literary Award for [insert] boy. • July: Black Poetry After the Black Arts Movement, an NEH Institute, led by Maryemma Graham took place. • September: Nate Marshall awarded Ruth Lilly and Dorothy Sargent Rosenberg Poetry Fellowships. • September: Jamila Woods awarded Ruth Lilly and Dorothy Sargent Rosenberg Poetry Fellowships. • September: Elizabeth Alexander joins faculty at Columbia University. • October: Joshua Bennett is selected as a National Poetry Series winner. • October: Ford Foundation appoints Elizabeth Alexander as director of Creativity and Free Expression. • November: Robin Coste Lewis awarded National Book Award for Poetry for Voyage of the Sable Venus. • November: A. Van Jordan wins Lannan Literary Award for Poetry.